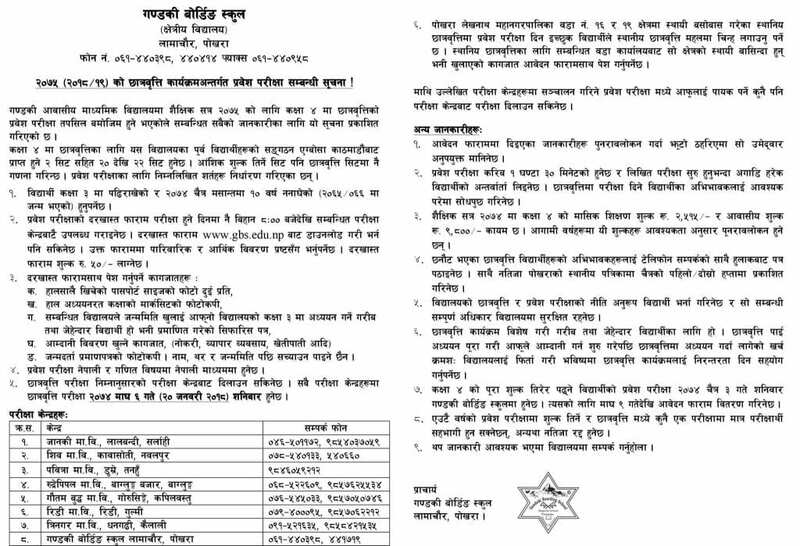 A leading school of Nepal listed in�Top 10 Schools in Nepal, GBS (Gandaki Boarding School) has announced entrance exam notice for class 4 students. GBS scholarship for class 4 students is announced. Along with it, GBS has announced full paying entrance examination for class 4 students. GBS Fee paying entrance exam for class 4 is going to be held on Chaitra 3 (17 March 2018). GBS Scholarship entrance exam for class 4 was held on 6 Magh (20 January 2018). Gandaki Boarding School, located in Lamachaur, is one of the most popular schools of Nepal.